After yesterday’s brain fart I started anew today! Much improved and visually pleasing ripples. These are going to be addicting I can tell! I can’t wait to work to the next color change which has led to some accidental sleep loss, oops! The winner from last week’s geek sock yarn-off is……Lighthouse! Mostly because I let my 7 month old pick and that’s what he chose to slobber on! Though maple leaves was the clear winner in the comment section. It shall be next I promise! So onto the needles Lighthouse went. And there I went wrong. This pattern uses a chart (very simple and very small) that my sleep deprived mommy brain couldn’t handle. Want proof? Instead of pleasing ripples I have drunken lighting bolts. So I frogged back to the stockinette toe. And I began again with what I thought was correct. Wrong again… I don’t even know what in tarnation I created here. But it too went to the frog pond. Third times a charm right? That’s to bee determined while I have a glass of wine or maybe just a nap? I just can’t handle charts I guess! 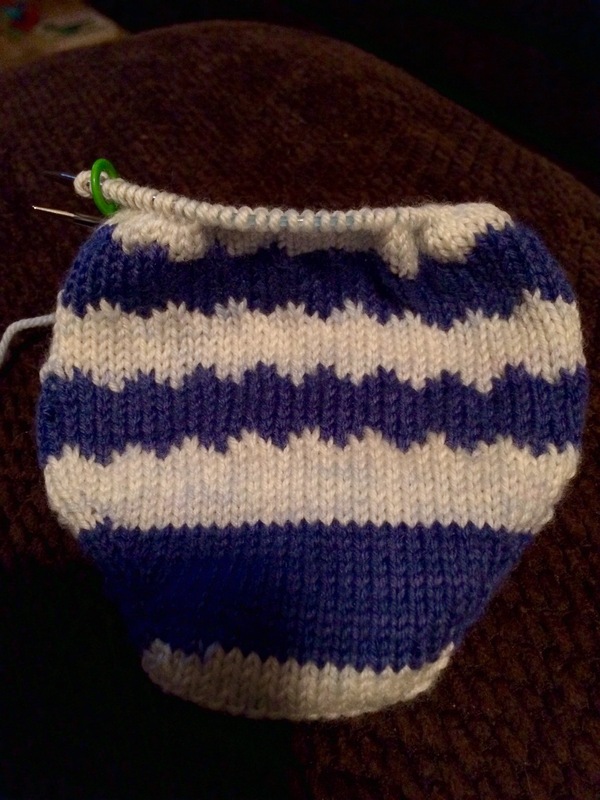 The first husband sock is done…sort of…. I worked for six inches past the heel and then used a stretchy bind off. I didn’t alter the ribbing for a cuff. Turns out that was dumb! Upon putting it on his foot the hubby found it to be too loose and the top rolled down. I threw in about four evenly spaced increases that need to come out and I need to devise some sort of ribbed cuff for structure. What do you think? 2×2….3×3? These things I must ponder. Good news is that at least I’m moving along on the foot of sock #2! I’m six inches of nine total foot knitting. These things might be done soon. Sigh, just as soon as I unpick and rework sock #1. Or maybe I’ll put it in time out until #2 is done, lol. I’m in a bit of a sock craze of late. It’s all I’ve been blogging about. I’d apologize but I’m not really that sorry. Socks are a great fit for both my mood and available knitting time. I recently finished my Rainbow socks and the first of my Husband Socks. So what’s next? Well I’m itching to start a pattern I saw in Knitty and on one of the blogs here on WordPress….Geek Socks by Wei Leong. Its spring here in Kansas but a tiny part of me is thinking ahead to fall. Jellybean is 7 months now and already wearing 12 month clothing. I REALLY want to have some hand knit sweaters for him this fall. I’m guessing I need to knit 18 months or bigger, lol. I might be willing to negotiate on seamless and willing to do seams if the pattern is that good. But I need to know your suggestions and “go-to” toddler knits. I’m looking for chic and simple for this sleep deprived knitter. Please post or link them in the comments. I can’t wait to see what comes! My husband sock has a heel! The 3×1 ribbing was very fiddly to pick up especially in dark yarn. But I got there! I’m hoping by weeks end to have a complete sock for the hubby to try on. Fingers crossed anyway! I’m very pleased to present…. I cast on 70 stitches to start. I nipped in a few after the heel to hug my ankle and increased pretty liberally at the cuff for my, ahem, muscular calves. I thought they turned out very a very good match. And I used every last bit of yarn. I think I had 12-14 inches left? I’m just pleased as punch with my most extravagant yarn purchase ever. All I did was knit and let the yarn sing! I feel like my Husband Socks are the tortoises of my WIPs. Slow and steady wins the race. Apparently so because I haven’t blogged about them since February! These are 3×1 ribbed sock for my husband. They live with my milk pumping supplies and get a few stitches here and there. I’m past the afterthought heel but wanted to add the heel so I can use up the remaining yarn for the leg. This means knitting from the inside and outside of the ball at once. Definitely not my favorite! The yarn is Knit Picks Stroll in Merlot. It’s a great yarn but very dark. Add in the singular purls next to three knit stitches and getting the heel picked up was a nightmare. I ended up using locking stitch markers to catch all the dropped stitches until I could work around to them! After all that drama….I need a time out. And this is only sock #1! My husband better love these (and next time he’s getting vanilla socks, lol). I’ve far too quickly come to the end of my Rainbow. I’m already working the ribbed cuff in purple. This yarn from KnitCircus has just been yummy. And the yardage generous enough for some very tall socks. The colors transition beautifully and made them addicting. Which is good because I have not had much dedicated knitting time lately, just a few rows here and there. But slow and steady still finishes the race right? Now my only conundrum is that I didn’t take very good notes on my increases in the rib section on sock #1. Guess I’ll just have to use my best guess! Just a quick fly by post for my second rainbow. I finished my first rainbow here. I’ve worked the toe increases and most of the way up the foot. It’s slow going as Jelkybean has hit a bump in the road when it comes to sleep. So I’m grabbing ZZZs where I can leaving little time for knitting. Such is the ebb and flow of life.